Cameras becoming smaller and easier to manage has led to monopods becoming more popular as a preferred camera support. As many are coming to the world of video from photography, a lot of folks already own one, so it’s only to be expected. They offer more mobility with a sort-of stabilised handheld feel to them. Tiffen’s new offering, though, takes video support to quite an extreme. Capable of holding up to 25lbs (11.3kg), the new Steadicam Air is a lightweight carbon fibre monopod with an easy foot pedal for quick height adjustments. And it weighs only 3.5lbs (1.6kg). It’s rare that I actually see new ways to utilise a tripod. When these videos pop up, they’re invariably just a rehashing of somebody else’s tips and tricks. It’s not that I think I’ve seen or know them all already, but it’s just rare that I see something new. Maybe you have seen or even attempted these techniques before, but I haven’t. Do you use a monopod? It’ definitely a useful tool for photographers and filmmakers, and it comes in handy when we can’t use a tripod. 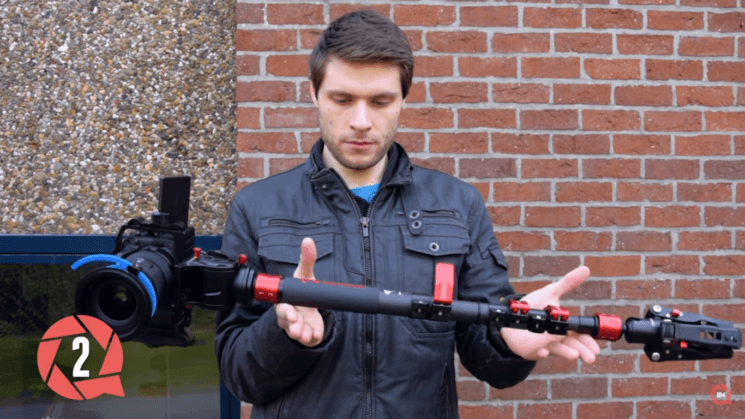 Jordy Vandeput from Cinecom gives you a few tips how to make the use of monopod creative in the videos. In his brief tutorial, you will see five ideas to maximize the use of your monopod and make it useful in different kinds of situations. Shooting video from a tripod isn’t always the easiest thing to do. They’re big, unwieldy, and while they serve a fantastic purpose, they’re not always fit for purpose. At sporting events, for example, it can often be difficult to turn quickly enough to follow fast action. For regular events where you’re mingling with other people, they just get in the way. This is where monopods step in. Libec have today announced their new fluid head Hands-Free Monopod (HFMP). While other free standing monopods are available, this one is specifically designed for the heavier rigs many of us find ourselves using for video. It has a thicker centre pole, stronger clamps, and bigger, locking feet. It comes in two flavours, monopod-only, to which you can attach your own head or as a kit. The kit includes the monopod and pan tilt head, which can also double up for use with regular 65mm bowl head tripods, too. Monopods are a wonderful tool to have if you need that extra little bit of image stability or happen to have a heavier lens attached to your camera.